Filmmaker Kalpana Lajmi who is the late Guru Dutt's niece, is not the least perturbed by the prospect of Bhavna Talwar's biopic on Guru Dutt. "Why should I threaten to go legal if Bhavna Talwar makes a biopic on my uncle? I don't know how or where these reports originated. Bhavna is a very fine filmmaker. I am sure she would do justice to the subject," says Lajmi. 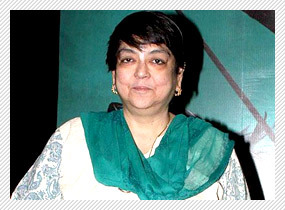 In fact Kalpana Lajmi and Bhavna Talwar are to meet over the project. Talwar wishes to have Lajmi on board as a consultant. But the filmmaker is busy with her own biopic on Bhupen Hazarika being produced by Pooja Bhatt. Kalpana Lajmi's reservations regarding Talwars' project have to do with a specific phase in Guru Dutt's life. Says Lajmi, "Why do I get the feeling that any biopic on Guru Dutt uncle would focus on his relationship with Waheeda aunty? Everyone thinks he committed suicide because of her. But this is not true. Guru uncle and Waheeda aunty parted ways in 1958. He committed suicide in 1964. So if Bhavna Talwar intends to shoot the film from the perspective of the romantic link-up then I'm afraid my cousin Tarun Dutt (Guru Dutt's son) would take legal action." Also, Kalpana feels Shivendra Singh Dungarpur (who recently made a brilliant documentary on film archivist P K Nair) has done extensive research on another Guru Dutt biopic. "He has worked on it for four years. So I feel he has the moral authority and the facts to do the needful." Reacting to Kalpana Lajmi's misgivings, producer Sheetal Talwar says, "My wife Bhavna's film is not about the suicide at all. So there's no question of sensationalizing the cause of his death. She has been extensively researching on Guru Dutt's life and has met people close to him. Of course Bhavna would love to meet Kalpana and Guru Dutt's son Tarun."